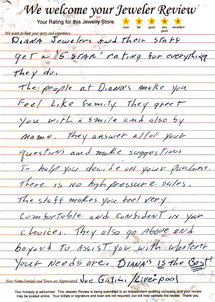 Diana Jewelers and their staff get a â€˜5 starâ€™ rating for everything they do. The people at Dianaâ€™s make you feel like family. They greet you with a smile and also by name. They answer all of your questions and make suggestions to help you decide on your purchase. There is no high pressure sale. The staff makes you feel very comfortable and confident in your choices. They also go above and beyond to assist you with whatever your needs are. Dianaâ€™s is the best!